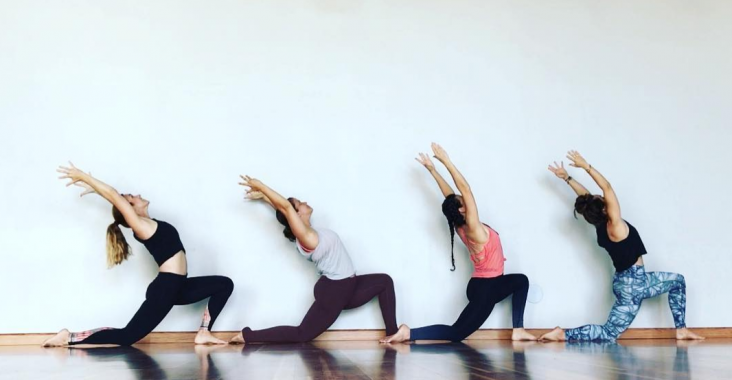 When someone tells me they’re interested in becoming a yoga teacher, the first thing I tell her (or him) is that it will completely change your life. I’ve been a yoga teacher for over 7 years now (woah). 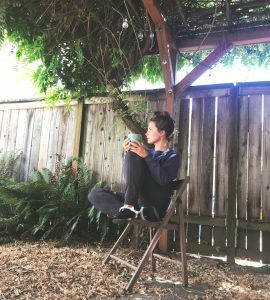 If you’d told me 10 years ago that I’d one day be a yoga teacher living in Portland, OR, I would have thought you were crazy. But here I am. It changes your own practice. After going through teacher training, it’s hard to simply just take a class as a student quite the same way again. You’re either thinking, “Why would they do that?” or “Oh, I like that, I want to remember that.” Either way you’re taken out of the moment and simply enjoying the class for what it is. In a really great class I can find that mindless state that we all love about yoga, but I can easily get caught up in analyzing. And just like anytime you take something you’re passionate about and make it a career, it shifts things. It’s now a job. When I’m teaching a lot, I often don’t want to stay in the studio to practice myself. My own practice definitely takes a backseat. I’m not alone! Debbie from Coach Debbie Runs just talked today about how her own training can fall off when working with her personal training clients. You work mornings, nights, and weekends. Do you have those early morning wake-up call classes already set up in your calendar? 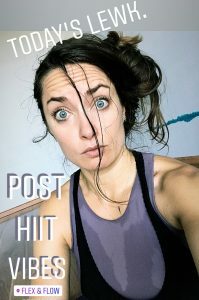 Post-work sweat sessions to work out the day? What about Saturday morning yoga and brunch dates with friends? So someone has to be there to teach all of those classes. The schedule of a fitness instructor is unusual and largely flexible. Which can be great. I can go to the gym or for a run in the middle of the day or on random vacations, but then I teach most evenings, weekends, and some early mornings. Most instructors also have a full-time job outside of teaching. So there’s the schedule balance between jobs, plus the exhaustion from bouncing from class to work and back to class. I’m always sweaty! Between teaching classes and my own workouts, it’s the sweat life for me. This is not all that unheard of. Jamie, Nicci, and I compare on a daily basis when was the last time we each had a shower. To put it nicely, it’s definitely not after every time we sweat. I am big on changing clothes after class, but showers? Not so much. I’ve actually gone on first dates after a run or teaching class. Call me crazy, but a guy is going to have to be ok with me being sweaty and in yoga clothes a lot of the time. Ok, so this one is definitely a pro and a con all rolled up in one. Being in spandex all day sounds amazing. And for the most part, it is. It’s comfortable, flattering, and enables #stopdropandyoga at all times. But I have a closet full of “real” clothes that I rarely get to wear. Putting on jeans and boots is dressing up for me, and I love how put-together it makes me feel. It’s nice to put in some effort to getting dressed in the morning. I live, literally, in spandex. So I’ve definitely accumulated a lot of yoga clothes, and for all kinds of purposes. I have the yoga clothes I’ll wear to teach versus practice, the spandex tights just for running, and then there’s the comfy stuff. When I’m in tight spandex all day, I like to get into cozy and fuzzy layers when I’m home. Right now I’m totally obsessed with prAna‘s Cozy Up Sweatshirt and Pant. 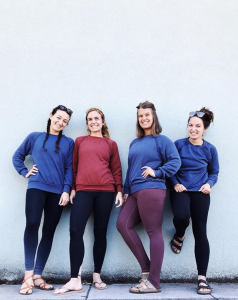 Not only ridiculously cozy, prAna’s new Cardiff fleece line is all about Clothing for a Positive Change. These pieces are made from a hemp blend, have natural odor-reducing properties, and features UPF 50+. Hemp doesn’t require any chemical pesticides or fertilizers. This makes it’s safer for the farmers that grow it as well as the land it’s grown on. Hemp is a drought-resistant plant and does wonders for the soil it’s grown in. Farmers who grow hemp are able to plant food crops in the same field immediately after harvest—something not possible with a lot of other crops. Once hemp is processed into fabric, it resembles linen in a lot of ways. It’s lightweight and remarkably breathable. It washes well, and because it’s blended with other materials like organic cotton, recycled polyester, and spandex, it doesn’t wrinkle as much as linen does. I think it’s fair to say we’re obsessed. All of us. We’re wearing Blue Equinox, and now I’m totally lusting after the Deep Basalm! 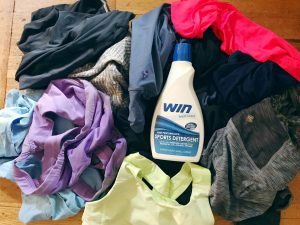 It’s my favorite layer to throw on after a trail run! It’s either that or my Cozy Up Zip Up, and they only make my post-Saturday morning run baby snuggles and cashew milk lattes that much better (both of which are already pretty great). 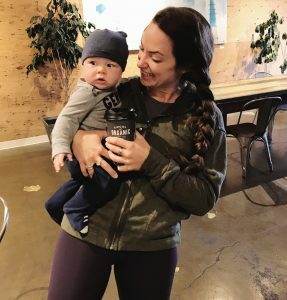 Hoodie by prAna, latte by Groundworks, baby by Jamie and Casey King. They even have a Cozy Up T-Shirt for those warmer days – perfect for fall layering strategies! Wanna try prAna’s new Cozy Up line? You can get 25% off prAna with the code LWILPRANA25. 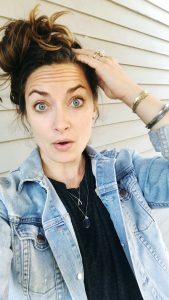 The thing about always being sweaty all the time and teaching fitness and working out for a living means I’m changing clothes multiple times in a day (most of the time). That means laundry piles up in a big stinky pile. There is always laundry that needs to be done. Want to put it to the test? Use the code WINSWPNK to get 30% off WIN Detergent at checkout on Amazon. Are you a fitness instructor? What are some of the secret not-so-glamorous parts of the job? Disclaimer: This post was sponsored by prAna and WIN Detergent in my partnership with the Sweat Pink community. All opinions expressed are my own. HAHA the laundry demands are NO joke! 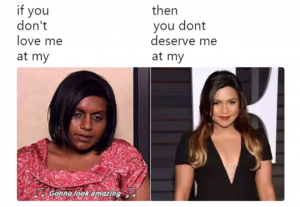 This is such a great (and very true!) post. The first part is SO true! After my training, I can’t help but analyze analyze analyse. Yesterday I took a class in Berlin where the instructor never mirrored us. So she would say, “turn right” and half the class would turn left to match her body language. It was so distracting because it’s such a simple fix!! We have a client that is interested in using it as part of an ad campaign for internet use only for 1-year. Further, we would be able to compensate for permission. Who would be the best person to speak to with that?